Can circadian lighting ensure a better transfer from home to care facility while improving health and quality of life? A new research project is to answer this question. In the coming years, the number of elderly persons with dementia at care facilities will increase but without additional hands to care for them. 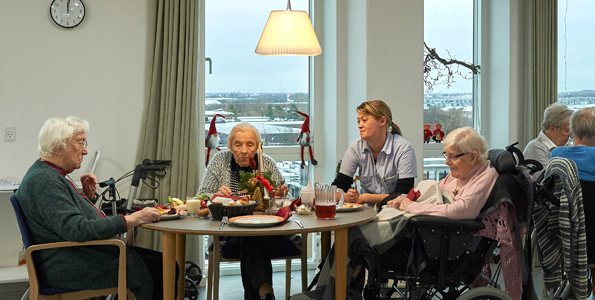 In Albertslund, Denmark, they hope that circadian lighting may be part of the solution to ensure good and dignified elderly care. That’s why Albertslund Municipality together with researchers and lighting experts have initiated a project to examine and document the effects of this welfare technology. The project is called Lightel and is supported by ELFORSK. 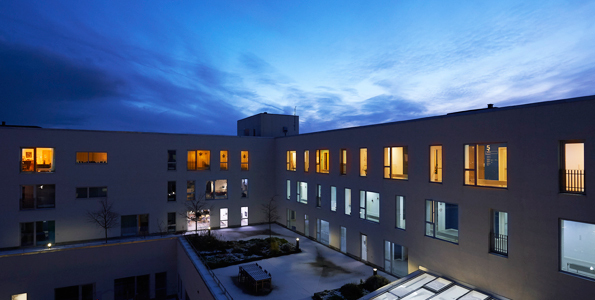 Chroma Zenit Circadian lighting has now been installed at the Plejecentret Albertshøj care facility. We expect our elderly residents to do better when they sleep at night. That their ability to concentrate will improve and that they will be able and more willing to take an active part in everyday life. Denmark is a world leader in circadian lighting, and last summer, Rigshospitalet published a study showing that circadian lighting has a positive effect on depression, tiredness and circadian rhythm in hospitalised patients. 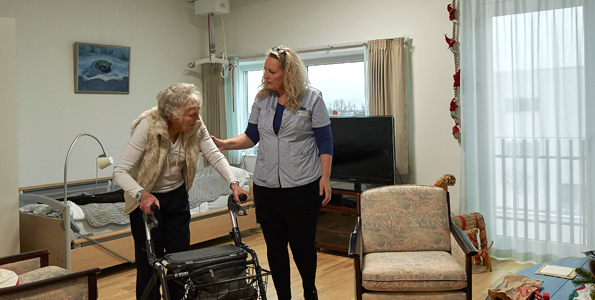 More than 30 care facilities have already implemented circadian lighting in eldercare – and have also achieved positive results. The Lightel project takes this a step further and examines its effect on residents with dementia in relation to health and quality of life. If the results are positive, circadian lighting will be a future focus area in the municipality, explains Kristina Aggergaard, project manager, Albertslund Municipality. We examine whether circadian lighting may help improve their level of function or slow down its deterioration in order to strengthen the dignity and quality of life of the elderly residents and to facilitate their transfer to the care facility. An interdisciplinary group of researchers from Clinical Research Centre, Copenhagen University Hospital, Hvidovre as well as anthropological light designers from Aalborg University Copenhagen will implement the study. ”We want to document whether circadian lighting is a welfare technology which works for elderly residents. 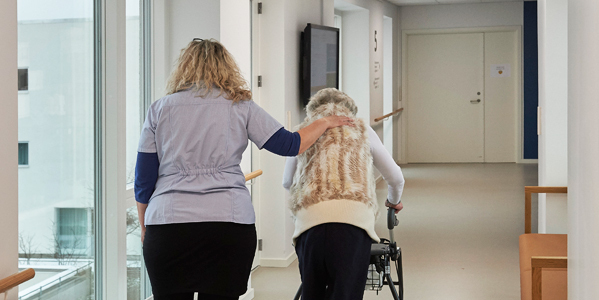 Elderly residents are often fragile and have experienced a profound change from living in their own home to moving into a care facility” says Linda Andresen, Laboratory and Staff Manager at Clinical Research Centre. The study is designed to provide ordinary lighting for 8 weeks at the care facility followed by circadian lighting for 8 weeks. Various examinations, observations and staff involvement will be completed to measure an effect on the residents in terms of ageing process and risk of illness as well as quality of life, appetite, depression, delirium, sleep, symptoms of dementia and mobility. At the same time, the study will examine what it means to elderly residents to have circadian lighting and the influence it has on their everyday lives. A total of approximately 33 residents and 35 employees will participate. Finally, the researchers from Aalborg University will measure and simulate the total dose of lighting received by the elderly residents – from natural lighting from the outside and from circadian lighting. The circadian lighting used in the project has been developed by Chromaviso that has specialised in health-promoting and evidence-based lighting solutions – through research projects at Rigshospitalet, among others. We have adapted circadian lighting to the dementia area to ensure that circadian lighting supports the residents’ welfare, the employees’ work and the activities of the care facility day and night. This is a coherent solution, which becomes an active part of the good care. This means that Lightel builds on existing research and knowledge. However, it was not on the cards that the lighting would be Danish, and at first, major, international players were considered for the project. “We appreciate our collaboration with Chromaviso who is on the forefront of circadian lighting. Their luminaires are of high quality and moreover, Chromaviso adds solid knowledge and experience to all project stages – from counselling to implementation,” explains Kristina Aggergaard. Also the department manager of Living Labs at Gate 21, who is responsible for reporting to ELFORSK and distributing Lightel, anticipates that this project will create a Danish position of strength in an international setting. “If the project succeeds in documenting circadian lighting further and subsequently introducing it as an integrated part of treatment and prevention in Danish healthcare, it will be a great boost to patients and residents. It will also realise savings for the municipality as a result of the inherent energy savings of the LED technology. Hopefully, Danish companies will be among the chosen ones when the ball starts rolling as this will create Danish jobs,” says Jacob Lundgaard. The results of the study are expected to be ready at the start of 2019 and will be published in scientific journals. Once the study has been completed, Albertshøj Care Centre will keep the circadian lighting. There are circadian lighting in the residents’ housing. It starts in the morning and is turned off at night. In the bathroom there is a faint night light on, which creates security and good orientation during the nights and toilet visits. In the hallways, the circadian lighting is on the all day. At night, a specially designed night light starts, which is without the blue tones that interfere with the body’s rhythm. It sends a clear signal to the residents that it is night and they have to sleep and at the same time provides the staff with a good light for their work. In the living rooms, dining rooms and kitchens, the circadian lighting helps set an atmosphere and create energy and enjoyment during the meals and other activities. Albertslund Municipality, Clinical Research Centre, Copenhagen University Hospital, Hvidovre, Aalborg University Copenhagen, Gate 21 and Chromaviso joined forces in the summer of 2017 to implement and document circadian lighting at Plejecentret Albertshøj. It is an interdisciplinary, public-private collaboration supported by ELFORSK. Moreover, part of the project is supported by the Danish-Swedish Lighting Metropolis innovation project. Chroma Zenit Circadian Lighting has been developed by the Danish company Chromaviso. The lighting follows the progress of the day and its colour temperature and intensity change just like natural lighting. It rises slowly as the sun and is strongest at midday. At night, it is dark near the residents while warm night lighting is on in corridors and common areas without the blue tones that disrupt the circadian rhythm. It is based on a clinically documented lighting protocol developed by Chromaviso in collaboration with sleep experts and researchers from Rigshospitalet Glostrup and Aarhus University Hospital. At the same time, the circadian solution considers the various situations during the day and night when light matters. For example, at night where warm orientation lighting helps the resident find the lavatory and return to bed or night working lighting which can be used when the staff needs more light for their care. The study will encompass the resident – first in normal lighting (8 weeks) and then in circadian lighting (8 weeks). The study comprises: Analysis of biomarkers and level of function, data from questionnaires, observations, interviews and staff involvement. This will be supplemented by an anthropological approach examining what it means to elderly residents to have circadian lighting and the influence it has on their everyday lives. A total of approximately 33 residents and 35 employees will participate. 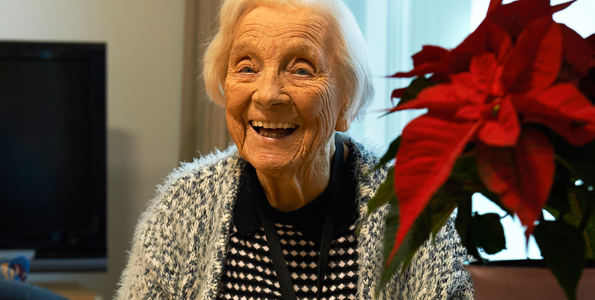 The researchers from Aalborg University will measure and simulate the total dose of lighting received by the elderly residents – from natural lighting from the outside and from circadian lighting.